This (beloved?!) former president, who himself fathered black children that he owned as slaves, succinctly sums up the historic racial biases inherent in every major Western art museum: black skin is not beautiful. Although you can find occasional black figures in the backgrounds of historical paintings by Bosch or Delacroix, you will find few ‘meaningful’ references in American or European art, despite their significant population in these places. 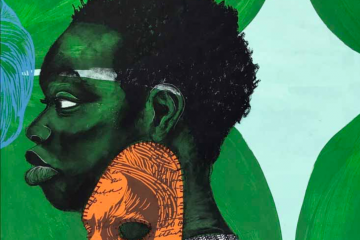 Even today, in the age of an Obama Presidency in the US, it’s shocking to realize how few depictions of black figures appear in major museums, but it is encouraging to find contemporary figurative artists who are now substantially filling this void. 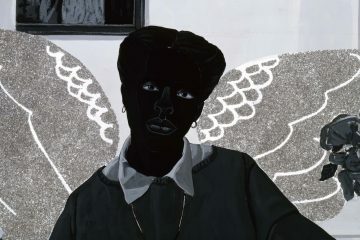 Kerry James Marshall, whose retrospective Mastry is on exhibit at the Met Breuer until the end of January 2017, is perhaps the most visible contemporary painter who creates portraits of black figures with exaggerated, ebony-hued skin in order to expand and challenge the art historical cannon. In his wake, a number of young African-American painters have taken up the cause and achieved international success like Kehinde Wiley, working within a rich tradition of European figurative painting to depict black faces and bodies in art historically significant ways. 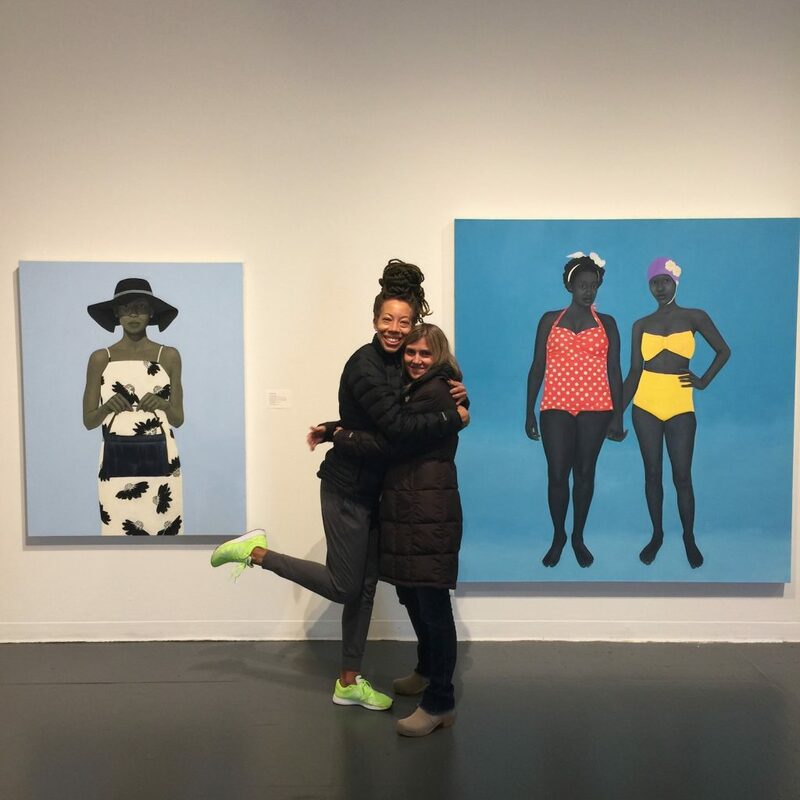 Baltimore’s Amy Sherald, the first woman to win the National Portrait Gallery’s Outwin Boochever Competition and a resident artist at Creative Alliance, is another such painter. 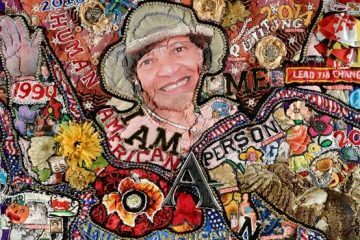 Joining her in About Face, an exhibition in the Creative Alliance’s main gallery, are contemporaries Rozeal, Ebony G. Patterson, and Tim Okamura. The result is a delightful mishmash of styles acknowledging a diverse range of contemporary figurative painting options specifically for and about black subjects. Despite the narrow genre of portraiture, the show is ambitious and varied enough to suggest a radically expanded future for an art historical cannon where black faces and figures are the rule, rather than an exception. Four larger-than-life-sized painting by Sherald sit at the physical and emotional center of this show. Since earning an MFA at MICA’s Hoffberger School of Painting in 2004, Sherald has essentially been making different versions of the same painting: a lone black figure, sometimes two, with skin tones rendered in shades of gray, contrasting with a colorful, abstract backdrop, and enhanced with symbolic props or clothing. The result of such an intense focus: Sherald has become a virtuoso at making these portraits, focusing on nuance and detail in a confident way. Each of Sherald’s portraits is deceptively simple and each elicits a personal and soulful response from the viewer. If you’ve visited Sherald’s studio you know her process is painstakingly slow; she produces just a few canvasses per year. Although they are consistent in their compositional structure, it is the artist’s deliberate and meticulous process that imbues them with a palpable spirit. Of all the works in this show, Sherald’s works are the most traditional, in terms of unadorned portraiture, and the most immediate in making a connection that feels intimate and magical and, somehow, timeless. 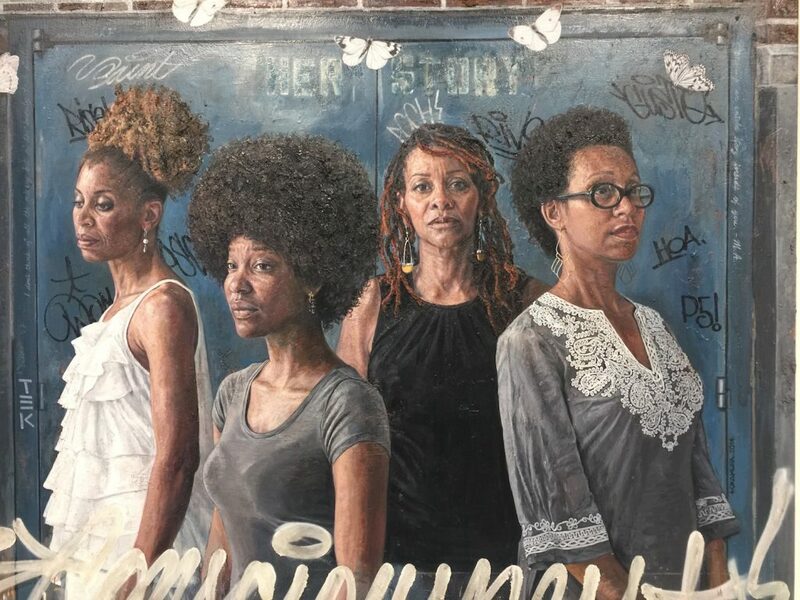 Tim Okamura, a Brooklyn-based Canadian painter, echoes a similar aesthetic to Sherald’s: life-sized or larger naturalistic portraits depicted through classical painting techniques and well-controlled but thick smears of crusty pigment. While Sherald’s portraits feel allegorical, Okamura’s feel specific, but both artists are successful in creating empathy and admiration in the viewer. Okamura complicates his portraits with evidence of contemporary street art and hints at an urban landscape, placing his figures within a specific time frame and context, sometimes strengthening and other times distracting from his compositions. Overall, Okamura’s dexterity as a painter carries all of these works but his ambitious need to take formal risks overtakes his message at times. There’s a palpable drama coming from these two contrasting forces that broils within his work, creating tension and unease. Okamura is an artist worth following and I am curious to see which direction he pursues in the future: his dedication to depicting black female subjects within a narrative structure or his investigation of the formal act of painting. Either way, these portraits are stunning in person and reward a viewer for coming in close enough to smell the dense clusters of oil paint. 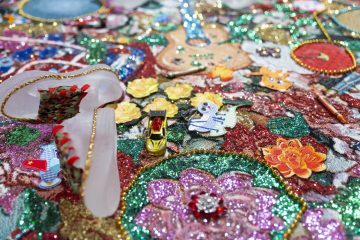 Jamaican-born and now Kentucky-based Ebony G. Patterson contributes an oversized attitude and considerable bling to this exhibit. In mixed media works on paper and a stunning wall installation, Patterson presents black bodies embellished, and also lost in, dense patterns of wealth. The largest piece, “Russian” from the Out and Bad Series, is an immediate attention grabber. 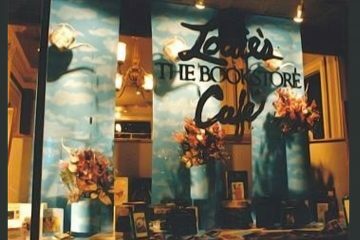 Velvety black and white flocked wallpaper defines an area of space embazloned with a glittering tapestry and footed by flowers, painted cinderblocks, and the prettiest male shoes – metallic Air Jordans and patterned loafers – you’ve ever seen. 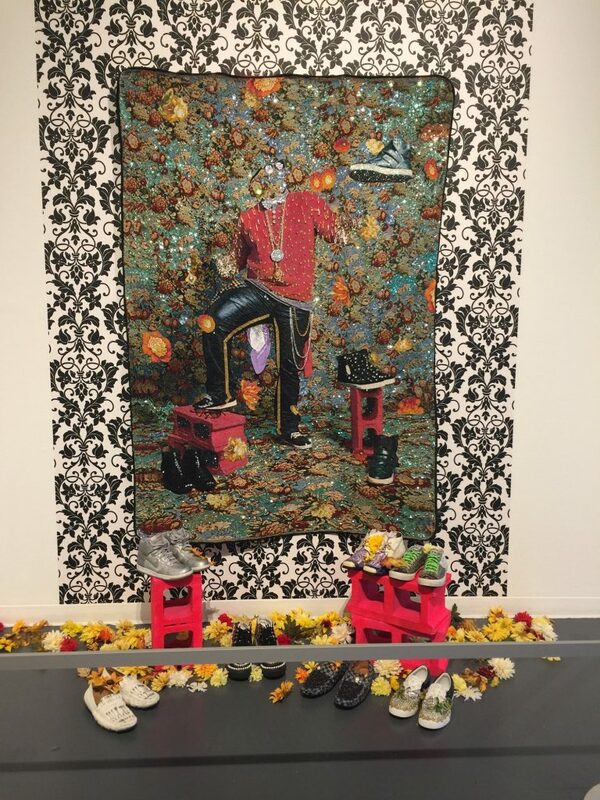 It feels like an over-the-top shrine for a deceased individual, where the physique under the clothing of the armless and headless figure depicted on the tapestry is clearly a young black male. Patterson is a rising international art star and numerous articles detail her interest in the beautiful contradictions of Jamaican dancehall subculture, where hyper-masculine attitudes are paired with over-the-top ‘feminine’ fashion embellishment, an environment where working-class Jamaicans celebrate their culture in the richest ways possible. Both captivating and overwhelming, Patterson’s art appeals to the human desire for beauty and visual complexity in texture, color, and form, while subtly referencing a cultural acceptance of black culture but a refusal to accept black individuals as human beings. 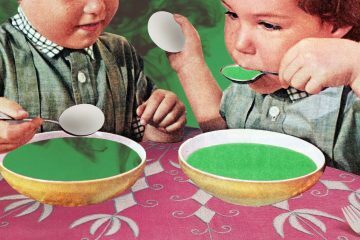 This piece manages to be both empathetic and judgmental, populist and sophisticated, decadent and sober. It’s devastating in its intense complexity and it demands your respect. Next to the boldness of Patterson and hyper-realism of Okumura and Sherald, DC-based Rozeal’s pieces get a little lost in this show. Her work, based on time spent in Japan and a fascination with Japanese appropriation of black American fashion and music, posits interesting contrasts and offers a universal message about romance, fashion, exoticism, and other-ness. Having seen her work over the years in other environments, including No Man’s Land at the National Museum of Women in the Arts last weekend, I have observed the power of this artist, especially in her own appropriation of the graphic style of Japanese woodblock prints in depicting the Ganguro style of Japanese teens who dye their skin brown and wear dark face paint in order to resemble the Hip Hop musicians they worship. In About Face, Rozeal’s works exude a mellow quietude and an abstract looseness that makes it difficult to compete for attention. Employing pale and monochromatic colors and mostly realized on large fabric scrolls, these works are professionally executed and meditative, but would have more visual impact if placed nearer to one another, defining their own context. Regardless, Rozeal’s works present a unique counter-point to this exhibit, asking the audience to decide if her portraits here depict Japanese Ganguro youth or black figures dressed in Japanese garb? Whichever direction she pulls you, the artist has successfully broadened your definition of ‘black portraiture’ within the context of the exhibit. After viewing this show I was reminded of the statement that America loves black culture, just not black people. 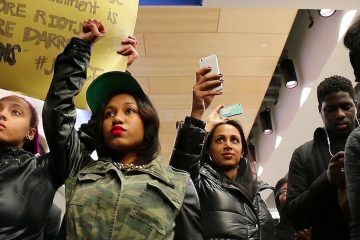 About Face serves as a testament that this attitude is slowly, finally changing. 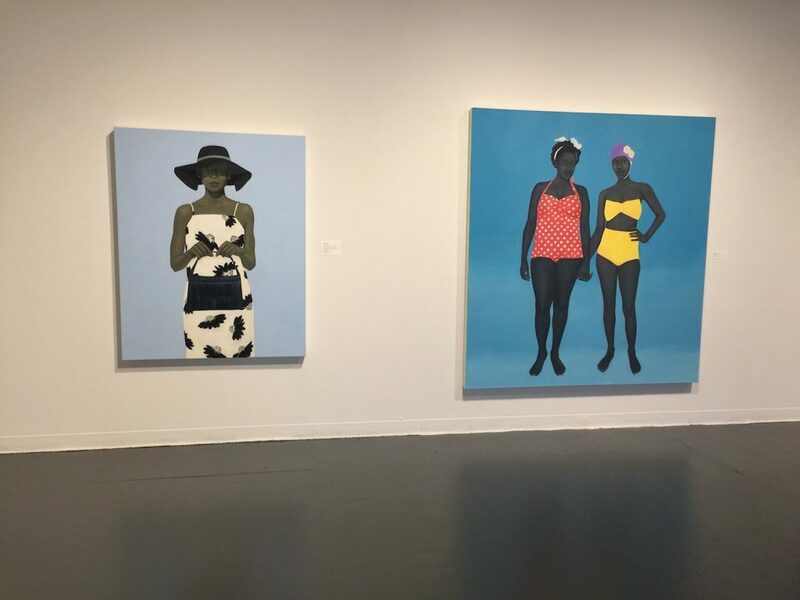 It is an exhibit where black faces and figures are envisioned by artists of color, where ownership of the subject’s gaze has not been mis-appropriated or tokenized, where subjects feel authentic and powerful. Whether you prefer dreamy realistic portraits, Japanese-inspired graphics, painterly realism, or embellished surfaces, About Face is a feast for the eyes and the imagination. 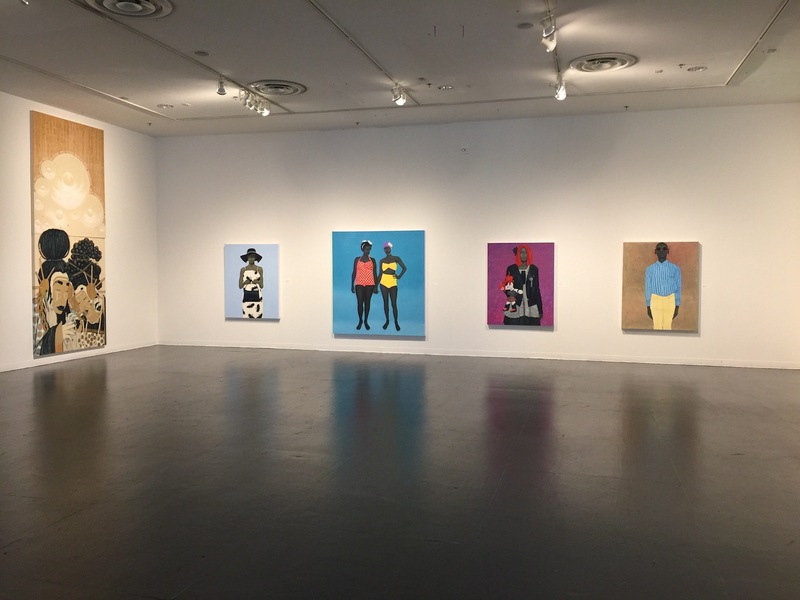 This show explores the power of portraiture as an effective tool for envisioning a future America where racial equality is valued and diversity is considered beautiful. This accomplishment is huge, considering the systematic and savage segregation of black faces, figures, and artists out of the spotlight (#oscarssowhite) and out of the art historical cannon for the past four hundred years in this country. 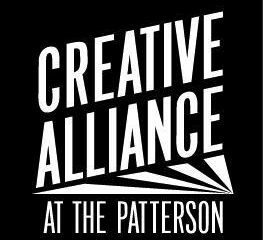 As these artists continue to develop their voices and techniques, their work will continue to inspire a more honest and inclusive dialogue within and through the arts. Not only do these portraits contradict Thomas Jefferson’s statement, proclaiming that “Black is beautiful,” they prove it. Our eyes, brains, and evolving perceptions thank them for it.